Musical America Blogs » Blog Archive » New Hall for Munich? Home > New Hall for Munich? 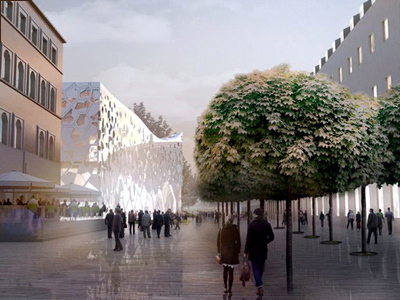 MUNICH — Could leaders here finally be moving ahead with a sorely needed new concert hall? Plans and sketches released this morning indicate progress on what has been an excruciatingly slow drive to supplement, or really supplant, the small Herkulessaal and hideous Gasteig venues. As presented by chief advocate Konzertsaal München e.V., the intention now is to abandon consideration of redeveloping part of Munich’s Museumsinsel and instead opt for a more practicable project on land just north of the Hofgarten, across the quiet cul-de-sac Galeriestraße. Designs show an airy, curvacious white structure with below-ground parking. The working name is “Neues Odeon,” a reference to the city’s fabled former Odeon concert hall a block away from the site. Galeriestraße would be pedestrianized, robbing visitors to the Altstadt of a somewhat hidden and cheap place to park, and the new hall would consume half of the somber and scarcely frequented Finanzgarten. That said, this latest location will feel right to many concertgoers here. This entry was posted on Thursday, December 11th, 2014 at 10:15 am	and is filed under Munich Times. You can follow any responses to this entry through the RSS 2.0 feed. Both comments and pings are currently closed.